Fantech SHR1200 - The Fantech SHR 1200 Commercial Heat Recovery Ventilation system (HRV) complements today's tight buildings. 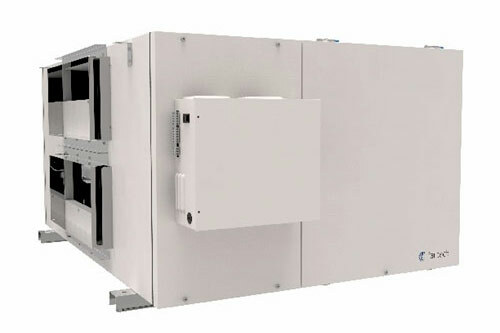 The SHR1200R is especially design for applications that require a fresh air motorized shut off damper and a fifth port to recirculate indoor air. Fantech Heat Recovery Ventilators (HRV) are designed to supply air into a building while exhausting an equal amount of contaminated air to the outside. The aluminum heat exchange core transfers sensible energy between air steams resulting in tempering of the supply air and reduced loads on the HVAC system. Duct Size: 8" X 20"
550-1,050 CFM @ 0.4" w.g.